7 countries, 12,000 km, 194 days – how much did it all cost? Surprisingly little. In fact, we found out that it’s cheaper to travel than it is to stay at home. We kept a note of all our costs from start to finish, and broke them down into four main categories – accommodation, food and drink, transport, and miscellaneous. We made a separate note of expenses such as visas, airfares and a few other things, as we wanted to be able to compare actual living costs between countries. Adding a $300 airfare to one country would distort this comparison. Note that I’ve rounded the figures to the nearest $1, so the figures below won’t always add up precisely. Thailand turned out to be the cheapest country of all, which surprised us a little. We expected some of the poorer SE Asian countries to be cheaper, but they weren’t. Thailand is an amazing country, and very affordable. If you can only afford to visit one SE Asian country, then Thailand should be the place you head for. We spend most of our time in Chiang Mai, so be sure to also check Cost of Living in Chiang Mai if you’re headed there. We only spent five days in Laos, so the daily costs might not really be representative of a longer stay. Two of our five days were spent on a slow boat traveling along the Mekong River. And another two days were in Luang Prabang, which is probably the most expensive town in Laos. Costs here were quite reasonable, with the total being bumped up by the traveling costs from the north to the south of the country. We didn’t like Vietnam as much as we expected to, and so only stayed a month instead of three, which was our original plan. We really liked Cambodia, especially Phnom Penh, and stayed longer than we had intended to. We would have stayed even longer if our visas weren’t due to expire. There aren’t too many places in the world that I can imagine living long-term, but Phnom Penh is one of them. Also see Cost of Living in Phnom Penh. George Town in Penang was another of our favorite places. I’m sure we’ll be heading back there sometime soon. We’d also like to explore some other parts of Malaysia, as just a month is hardly any time at all to cover it. Also see George Town Living Costs. If you’re on a tight budget, then Singapore is a place to avoid. While Singapore is one of the cleanest places I’ve ever visited, it’s also probably the most sterile place. I could never imagine myself living there, and have no desire to go back. We loved the relaxing two weeks we had in Bali and also the climb down into Ijen Crater. Indonesia is a large country that needs much longer than a month to explore. For a more in-depth look at our Indonesia costs, see Bali & Indonesia Travel Costs. We spent an additional $1,331 on visas, flights and tours. So that brings the grand total to $11,295, which comes to $29 per person per day. You should note that we started and ended our travels in Bangkok, so didn’t have any additional costs at the start and end of our travels. If you’re traveling from outside SE Asia, as most of you will be, then you’ll need to factor in the cost of flights to and from SE Asia. 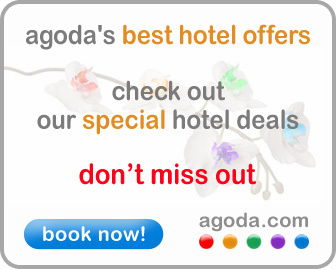 We booked most of our hotels via Agoda. Click the link below for some great hotels at great prices.